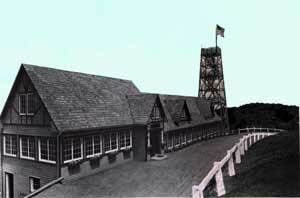 The town of Windham, Ulster County, New York, was formed in March of 1798. History books disagree as to whether it was the 23rd or 27th of that month. Windham became the western half of Greene County upon the latters creation on March 25, 1800. The seven towns of Ashland, Halcott, Hunter, Jewett, Lexington, Prattsville and Windham were created from what we might call "Old Windham." The towns of New Goshen (Lexington) and Greenland (Hunter) were taken from the southern part of Windham in 1813. 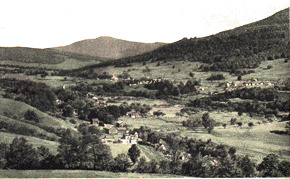 The town of Schoharie Kill (Prattsville) was created from the northwest corner of Windham in 1833. Scienceville (Ashland) was formed from parts of Prattsville and Windham in 1848, Jewett from parts of Hunter and Lexington in 1849, and Halcott from part of Lexington in 1851. The present town of Windham contains three hamlets --Windham, Hensonville and Maplecrest. It also contains regions known as Brooklyn, Brooksburg, Mitchell Hollow, Nauvoo and North Settlement. Part of the hamlet of East Windham is located in Windham and the rest is in the neighboring town of Durham. The town and hamlet of Windham were probably named for either the town or county of Windham in eastern Connecticut. The hamlet, or more specifically, the business district of Main Street, has undergone several name changes. It was called Batavia for the Batavia Kill, which flows along its entire length, and for the Batavia Patent, a strip of land lying along both sides of that stream. The post office used the name Batavia from about 1801 to 1803. It probably fell into disuse when the town of Batavia in Genesee County, NY was formed on March 30, 1802. Windham was known as Osbornville when a post office was established there in 1831 with Bennet Osborn appointed as the first postmaster. After serving in the Revolutionary War, Nathan Osborn and his family came here in 1799 and took up residence in North Settlement. Bennet Osborn was Nathans son, and it has long been assumed that the name Osbornville originated with its first postmaster. When Colonel Zadock Pratt became a candidate for Congress in 1836, Bennett Osborn campaigned for his opponent. During his first term of office in Washington, Pratt saw to it that Osbornville was changed to Windham Centre and William Robinson replaced Bennet Osborn as postmaster. The name of the hamlet was shortened to Windham in 1873. The hamlet of Hensonville was named for the Henson family. John Henson, son of Revolutionary War soldier William Henson, was appointed postmaster in 1853. Prior to that date the hamlet was known as Baileys Four Corners. The home of postmaster Ethan S. Bailey stood on the southwest corner at the intersection of two roads that created the four corners. The hamlet of Maplecrest was originally called Big Hollow, an appropriate geographic name for this small community lying in a valley or "hollow" surrounded by the Blackhead mountain range. Tourists had long come to the mountains for their health as it was thought that the high altitude, clean air and pure water could cure many ills. A place referred to as being in a "hollow" was believed to be detrimental to the tourist industry. It was for this reason that a new name was chosen, one that suggested mountain peaks and streets lined with maple trees. 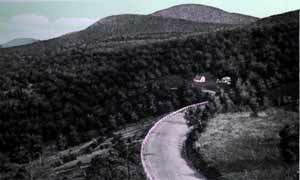 Big Hollow was changed to Maplecrest on May 23, 1921.